Peonies... Gardenias... Orchids... Hydrangea... You could say we're flower obsessed! But I guess that's what happens when you get to work with fresh flowers every day! So we thought we'd have some fun outside our 'everyday' and share with you some of AB's top picks for floral inspired bridesmaid's gifts! This is the perfect gift for your Bridesmaids on the morning of your wedding. A soft, silky robe to lounge in while you and your girls get prepped for the big day! It is adorable in photos and a great, usable keepsake after! With delicious floral scents like Freesia, Violette, and Rose these luxury scents will remind your bridesmaids how grateful you are to have them every time they light them. It's also sweet to get personal-- is there freesia in your girls' bouquets on the big day? Then the freesia candle would add even more sentiment! Makeup bags are the perfect keepsake gift for your bridesmaids on your wedding day. Help them stay organized while they get ready on the big day! We love these sweet toile pouches from Quilted Koala. They are elegant & classic! Who doesn't love colorful nail polish with fun & fabulous names? Grab your girls a bottle of St. Lucia Lilac, Flowerista, or Petal Pink from the Essie nail polish line, throw in a mani/pedi gift certificate and you have an adorable gift to give your bridesmaids and keep them pampered! Oooh Paper Products. Did we say we were obsessed with flowers? We are also in love with beautiful paper! 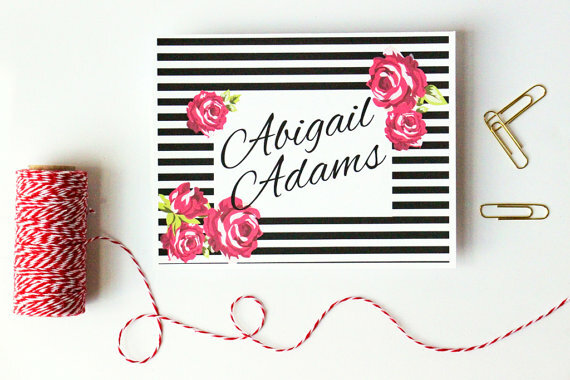 Get your bridesmaid's customized stationary for a thoughtful, useful bridesmaids gifts. Some of these products we found on Esty shops are super cute! Treat your girls to some beautiful scents! A great idea is to gift your bridesmaids various testers along with a gift card to purchase the one they love! Some floral perfumes we love are Marc Jacobs Daisy, Miss Dior Blooming Bouquet, and Jo Malone Peony & Blush Suede. So she has the dress you picked out. Her flowers are ordered. Jewelry determined. Now all she needs is shoes! Especially if you have a particular shoe in mind for your bridesmaids, it could be a thoughtful treat to gift those beauties to her! These Badgley Mischka Blossom Pumps are a classic. She'll never want to take them off! Celebrate your big day with your girls with some fun drinks! Of course some bubbly prosecco or champagne is fun to toast to while you get ready, but a craft bottle is a fun gift to your girls so they can enjoy it at a later time. Later, when they enjoy a cocktail with their gift, they can cheers to your wedding and remember all the fun! We are intrigued by this Botanical Vodka made by Pinky. Blended with rose petals and violets it sounds like a floral treat!